Watch Sarah cook up the perfect gumbo! Sarah Savoy is a Louisiana singer and chef with hell-raising credentials. Daughter of legendary musicians Marc and Ann Savoy, she grew up in the heart of Cajun country and learned her culture around the kitchen table. In The Savoy Kitchen she brings together recipes from three generations: from her own fresh take on Gumbo and many other Cajun classics to her father’s Courtbouillon cooked over an open fire, and her grandma’s Fig Drop Cookies. 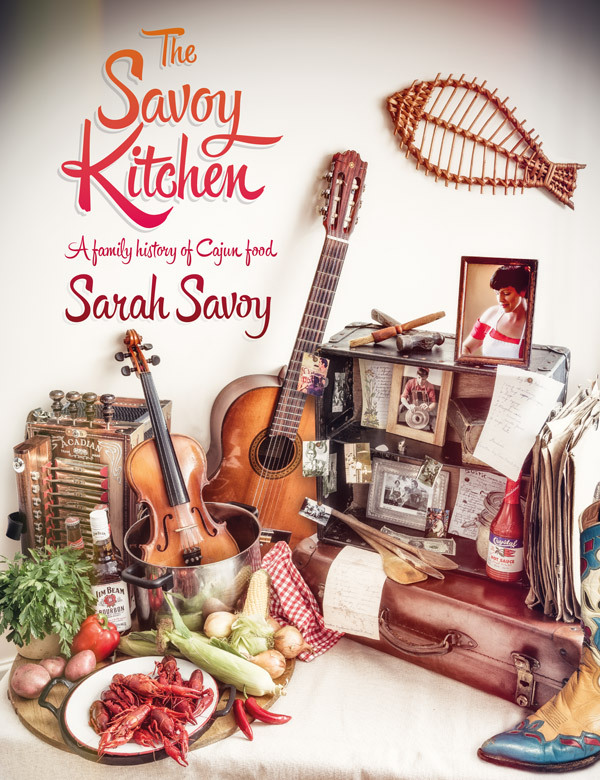 Part-cookbook, part memoir, The Savoy Kitchen is illustrated with drawings and photographs by her sister, Gabrielle Savoy, which capture perfectly contemporary Cajun life as lived by one of its foremost musical families. Currently living in Paris, Sarah frequently tours the UK with her band, Sarah Savoy and the Francadians, and is a regular guest at world music festivals including Womad, Songlines Encounters and the Llama Festival. As well as being in demand for her musical skills, Sarah is often booked to lead Cajun cookery demonstrations in which she cooks up a range of authentic Louisiana dishes accompanied with live music from the band – a wildly popular format that has taken her from The Kitchen Garden (Birmingham) to EAT at The Sage (Gateshead) and Ludlow Food Festival. Her recipes have featured in Jamie Magazine and Songlines, and she has guested on shows including BBC Radio 2’s The Folk Show and Radio Scotland’s Kitchen Cafe. Sarah is also one of the featured chefs on internet cooking channel QOOQ.com. Steve Riley, Steve Riley & the Mamou Playboys.